Lexus overtook Jaguar to regain its title as the brand that does the best job of pleasing customers in the service department. Toyota Motor Corp.s luxury division ranked atop the J.D. Power and Associates 2009 Customer Service Index Study released today. No. 2 Jaguar, sold by Ford Motor Co. last year to Indias Tata Motors, topped Lexus in 2007 and held onto the crown in 2008. BMW, Cadillac and Acura rounded out the top five for 2009. Dealerships with the happiest service customers have a better chance of retaining them after vehicle warranties expire, J.D. Power said. Dealer networks of the highest-ranking brands pocket about 80 percent of customers service dollars. The figure is less than 60 percent for the brands with the lowest scores. Satisfied dealership customers are also less likely to go elsewhere for routine maintenance. Consumers spend about $310 annually on oil changes and other fixes in the first five years of ownership, J.D. Power said. 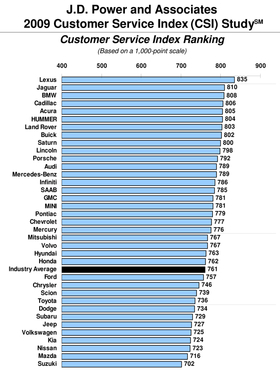 BMWs third-place finish reflected a jump of six slots from the 2008 study. No. 4 Cadillac retained its ranking among the top five, and Acura rose to fifth from seventh. The five lowest finishers among the 36 ranked brands were Volkswagen, Kia, Nissan, Mazda and Suzuki. J.D. Power based its study on responses from 106,059 owners and lesees of vehicles from the 2004 through 2008 model years. The customers were surveyed in the final quarter of last year.